Yes, we know sunbathing is a beauty sin that’ll cause premature ageing. And yes, we’ve been told a million times to stay in the shade during the midday heat. But, whoever said pale is interesting clearly hadn’t seen the unearthly pallor of our post-winter bodies-which just isn’t going to work with this summer’s shorts. And there’s no getting away from the fact a good tan takes half a stone off, and makes you look more toned and just a bit healthier overall. The even better news? There’s been a bit of a turnaround on safe-sun advice, following research on the role of vitamin D in helping prevent illnesses from depression to cancer. Whereas we used to be told to avoid the sun at all costs, now it’s all about safe exposure, since your body needs sunlight in order to make vitamin D.
So, here is the most honest, straight-talking suncare advice feature you’ll ever read. The one that realises you know the risks but you’re going to do it anyway. We’ve answered the questions you always wanted to know and found out exactly how to get your glow the healthy way. Can I use last year’s SPF leftovers? TRY : This year’s hot new range, Guerlain Terracotta Sun Moisturiser Tan Booster, tunes into your hair and skin tone for a tailor-made way to tan safely. With an SPF30 for burn-prone blondes and redheads, and an SPF15 for olive-skinned brunettes, it contains UVA and UVB protection, plus a new-carob-extract complex that stimulates melanin to boost your tan. Need high protection but crave a deep been-to-the-Caribbean colour? New Piz Buin Tan & Protect Accelerating Oil Spray SPF30,contains the agent Melitane to seriously rev up tanning-so you get protection and a perfect glow. How bad is it if I burn a bit? There are more than 2,000 deaths from skin cancer every year-yet almost half of us don’t bother applying sunscreen when we’re on home turf, even though we’re just as likely to turn lobster-pink after a day picnicking in the park. ‘Sun damage is cumulative – burning in childhood increase your risk of developing skin cancer later in life. ‘When skin is damaged by burning, it starts to peel, forming new skin with a pale pink tinge underneath. You must protect this new skin at all costs.’ Play it smart by completely covering new skin as it forms with long sleeves or, if possible, stay out of the sun until it heals. Any areas freckled by earlier sun damage should be kept under wraps or a high SPF. TRY : Korres Yoghurt Cooling Gel, helps restore the pH balance of damaged skin, while the magnesium in Better You Original Magnesium Oil Soak, soothes and promotes faster healing. What protection do I really need? SPFs aren’t the be all and end all-to protect skin the smart way, we need to think laterally. ‘In summer, dark and medium skins should stick to SPF15 or SPF30, while blondes and redheads need an SPF50. ‘Yet the SPF only indicates protection against UVB rays (primarily responsible for cancer and burning)- not skin-ageing UVA.’ Its recommend using a broad spectrum product with the circled UVA symbol on the bottle every day. Thinking of investing in an SPF that’s even higher than a 50 so you can stay in the sun for longer? No matter how high the SPF, some anti-UVA protectant ingredients degrade over time, so you’d be left unprotected ingredients degrade over time, so you’d be left unprotected from ageing rays. TRY : Estee Launder Bronze Goddess SPF15, glides on beautifully for broad-spectrum protection. Nivea Sun Pure & Sensitive SPF30 Sun Spray, contains no perfume or colorants, so is perfect for sensitive skin. Is there ever a healthy way to tan? Don your sunnies and lunch al fresco because the best way to tan is to make ‘gradual’ your holy grail. ‘Wearing an SPF15 moisturiser or foundation and going out into the sun in spring will allow enough UV light through to stimulate the production pigment, melanin. ‘By exposing your face to gentle springtime sun, it gives your skin time to increase its melanin stores – so you’ll protection by the time the stronger summer sun arrives,’ he adds. TRY : Skin-soothing Hourglass Veil Mineral Primer SPF15, provides protection under your foundation for gradual exposure pre-holiday. Dust on some DermaQuest On-the-Go Finishing Powder SPF30, to top it up during the day. Functionalab Opti-Tan, a daily beta-carotene and antioxidant supplement, will also rev up your body’s natural melanin production. ‘If you just want to protect against sunburn, many cheaper products will do the job. ‘However, the high concentration of active ingredients needed to ward off premature ageing and provide skin benefits will inevitably cost more.’ So invest in a good summer-sun survival product and you’ll save money on repairing the damage later down the line. TRY : Institut Estederm Photo Regul Face Cream, doesn’t just provide sun protection, it minimises existing patches of pigmentation, too, while Decleor Protective Anti-Wrinkle Cream SPF50, protects while stimulating collagen production. For an all-round superhero, Dior Hydra Life BB Cream SPF30 PA+++, combines maximum UVA protection with smoothing plant extracts and pigment that adapt to your skin tone, so it not only makes your skin look youthful, it protects against wrinkles, too. Is after-sun a waste of time? Whatever your inner sun-worshiping demons tell you, after-sun is no cure-all for serious burning. ‘If your skin is red, sore and hot to the touch, any claims a product makes about being able to reverse this significant damage are likely to be false,’ says consultant cosmetic surgeon. ‘However, a good after-sun will cool and hydrate the skin and inflammation in the short term.’ Look for an after-sun containing moisturising aloe vera and anti-inflammatory zinc cream. TRY : Banana Boat Aloe After Sun Gel Ultramist Continuous Spray, has the bonus of being a spray-on, so you don’t have to touch sore skin. Use zinc-rich SkinCeuticals Hydrating B5 Masque, on a sun-scorched face, or go from poolside to party with new Garnier Ambre Solaire Golden Touch After Sun, which contains moisturising monoi oil and leaves skin with a hint of shimmer. Do I need a separate face product? While it can be tempting to double up, your skin will thank you for using separate products. ‘Skin on the neck, chest and legs is thinner and more vulnerable to dryness, sun damage and premature ageing than the face. So stave off a wrinkly decolletage and scorched shins by label-checking body sunscreens for ceramides, niacinamide, hyaluronic acid and oils to pack a moisturising punch along with sun protection. TRY : Dr Nick Lowe The Street is Out Neck & Decollete Firming Cream SPF15, contains algae extract to lighten skin, while new Vichy Capital Soleil SPF40 Sun Oil, is super-hydrating for scaly shins. Suntegrity All Natural Moisturising Face Protection SPF30, combines a cirtus scent with sun defense and antioxidant astaxanthin, which speeds up skin repair. And be kind to you eyes with Clarins Sun Wrinkle Control Eye Contour Care SPF30UVB/UVA,b which firms and de-puffs as it protects. The stuff you really should know about sun protection, just in case you’ve forgotten! SPF stands for sun protection factor but it protects only against UVB (which causes burning and cancer) not UVA (responsible for ageing) rays. An SPF of 15 filters out about 93% of UVB and SPF30 about 96%. Always look out for the circled UVA symbol so you’re protected against both types of UV rays. PA stands for the protection grade of UVA so is another way of checking that you’re guarded against ageing. The more ‘+’ symbols there are (they range from one to three), the greater the UVA protection. SUNBLOCK is generally used as a term for products that cut out both UVA and UVB rays using a physical barrier, such as zinc oxide, though no product will actually ‘block’ all the sun’s rays. 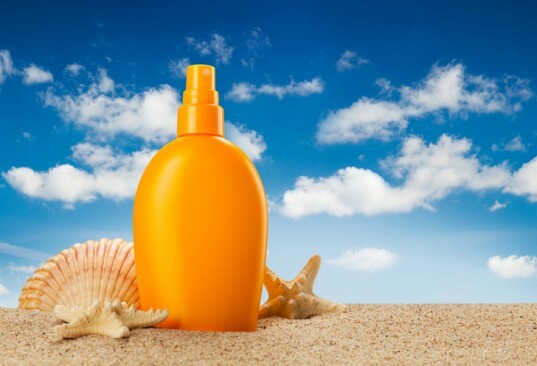 Sunscreens use chemicals that absorb UV light so it doesn’t reach your skin. COVERAGE refers to how much you use, and how often you apply it. You need about 1tsp for the face, and 1tbsp each for the torso, back, arms and legs, applied 15 minutes before sun exposure to give it time to work. Repeat every two hours and after sweating or swimming -even ‘water resistant’ isn’t fool proof. SKIN TYPE is fundamental to deciding on what SPF you need. Your susceptibility to burning can be categorized with the Fitzpatrick Scale, from level I (always burns and never tans, so will need SPF50 sun protection abroad) to level VI (Afro-Caribbean skin, rarely burns but still needs UVA protection). MIDDAY SUN The hottest hours of the day are between 12 pm and 4pm in the UK, and 11am and 3pm as you head south.